This is a stylish and modern one-bedroom apartment in Barcelona, situated only steps from the sunny Barceloneta beach. It is located in a beautiful neighborhood, with many fantastic cafés and seafood restaurants, and it is only a short metro ride from the center of Barcelona. 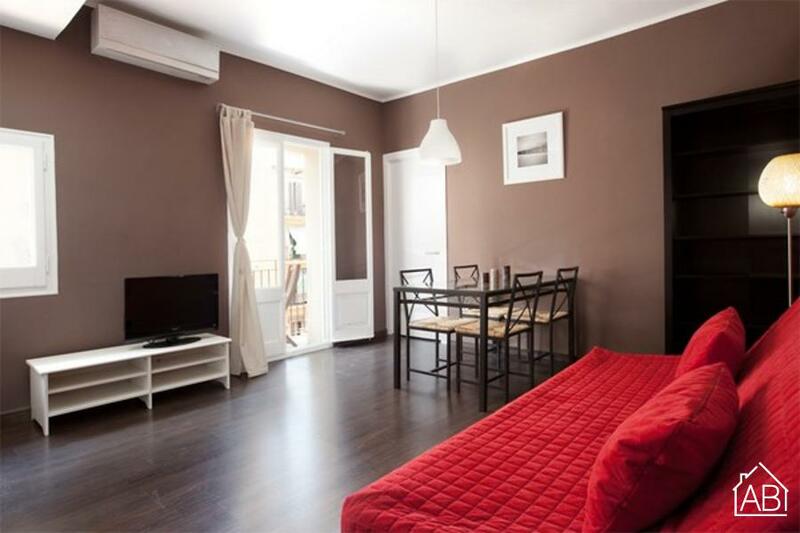 The living room of this contemporary apartment has a TV, comfortable double sofa bed and access to the balcony overlooking a typical street in Barceloneta. The American kitchen is well equipped with up-to-date appliances and utensils for all your cooking needs,allowing you to make your very own home-cooked meals. The rich colour scheme of this apartment is continued into the bedroom, which has two single beds. Accommodating up to four people, this apartment is an excellent choice at any time of year, not only due to its desirable location, but also as it has both heaters and air-conditioning. Please note: there is no elevator.